Just a word of warning for those who are blissfully planning to come to town this weekend – May 19 and 20, for a quick getaway and wine tasting adventure. Unless you are staying with friends, you will have to change your plans! It is graduation weekend here at the University of Virginia, and every hotel, B&B and motel is booked, as is most of the restaurants. The town will be a madhouse! Our wine tours are booked as well. So adjust your plans for a couple of weeks out! Right now we are enjoying wonderful weather and have had enough rain for our gardens to come alive! As we work towards getting our B&B license we have lots planned for our guests. The landscaping has started to bloom so we can figure where to put the new walkways. 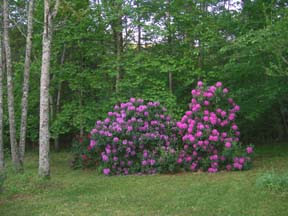 You can see to the left that our Rhodies are looking glorious! Irises have popped out as well. 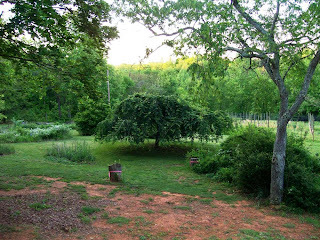 Below is the view from the deck off the dining room towards the vineyard behind the Weeping Cherry tree. All greening and blooming right now! In the vineyard, we picked a Virginia Wine Tour favorite grape to plant: Chamboursin! As you see below they are growing fast protected in their growing tubes from our deer family. We will let them grow as tall as possible and then trim them down to the ground in the fall so the roots will have a good chance to settle in.